After sitting through a demo at the Paradigm and Anthem booth at CEDIA 2010, Chris Heinonen of Secrets of Home Theater walked away with one request from our team - to PLEASE send him a pair of S2's and the Integrated 225 amplifier for review. "When I fired the system up... these qualities came through in spades. The soundstage of the S2s was very wide, but most notably was very deep. Much of the music seemed to radiate from beyond the back wall, really bringing the depth of the stage that it was recorded on back to your listening environment. The picking of a guitar came through with the metallic notes of the strings coming across, but it was a very easy sound to my ear. In person, the sound of someone picking a guitar is usually not something that would cause you to wince, but with many tweeters you can find that those higher notes will have a glare to them that is very fatiguing. The Beryllium tweeters were very detailed, but still smooth and very relaxing to listen to..."
"Unpacked, this monster weighs in at almost 43 lbs. and a peek under the hood lets you quickly see why. A good-sized toroidal transformer is inside, along with two massive Nichicon filter capacitors in the middle of the board. Two massive heatsinks, one per channel, are visible through cut-outs in the bottom of the chassis which add to the weight, but also allow it to run without any fans to dissipate heat and interfere with the music." "The Paradigm/Anthem combo presented a wonderful window into the recording studio. Though originally mastered digitally at 24/96 before the transfer to vinyl, there was exceptional clarity to the recording and the attributes that I had come to love with this setup really shone through again. The soundstage was wider than the speakers and again extended well beyond the rear wall in depth. The musicians and their instruments had their own clear space on the recording... The sense of being next to the studio while they recorded was brought home to my basement. I sat back to enjoy the show, only getting up from my seat to flip the record." 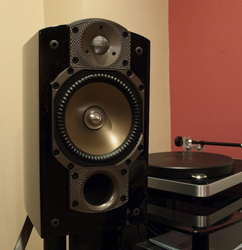 "The weeks that I had the Paradigm and Anthem setup in my listening room were nothing less than a joy. While many people would scoff when you might say that close to $4,000 for a set of speakers and an integrated amp is a bargain, when a setup like this can provide so much enjoyment and remove the desire to need to upgrade anytime soon, I really feel that it can be classified that way... you have an incredibly high quality system that will bring you joy for years to come."